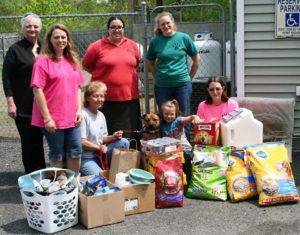 We would like to send a great big THANK YOU to CDPHP for their generous donations to our shelter!!! Sasha says – Thank you, CDPHP!!!!! I’ll sit here nice for a picture if I can have one of those milkbones….. The employees of CDPHP chose to support Regional back in 2013 – they realized that we were a small facility, but did the best with what we had. It’s a long trek from Albany, but they have continually supported Regional for the past 2 years, and have pledged to continue in the years to come. We are honored to have the support of such a generous group of people! Thanks to this donation, we can feed our 9 dogs for 3 weeks. They have ample treats, new blankets, and a few of them have new dog beds. They are so happy! The volunteers have new cleaning supplies (yes, we get excited about things like bleach and laundry soap!!). Regional runs completely off of donation. Donations like these, regardless of size, help to offset the costs of food and supplies, and allow us to use the donated and raised money for emergency medical care and keeping the lights on. For a list of what Regional can always use, please see our donation page. Since we can’t say it enough….THANK YOU!!!! !